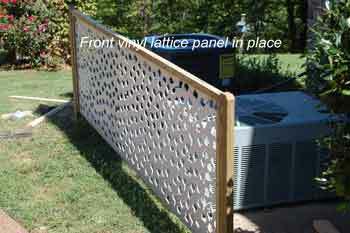 We used lattice vinyl from Acurio LatticeWorks to create a lattice privacy fence around our air conditioner units. We needed something that would not only hide the units but also be easily removed for regular air conditioner maintenance and repairs. In Part I, Steps 1-7, we constructed the post holders, located the posts, and poured the concrete. 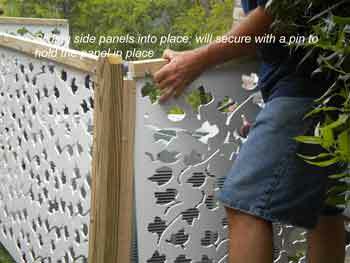 Now we will show you how we built the vinyl lattice panel frames and installed them on the posts. 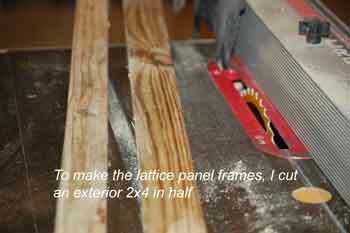 Cut a 10' (or length of your lattice panel) treated 2x4 in half. 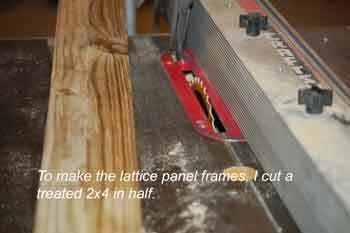 Cut a sufficient amount to frame the top and sides or your lattice panels. 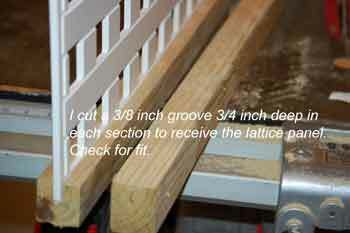 Cut a 5/16 wide x 3/4 inch deep groove down the center to receive the lattice as shown below. 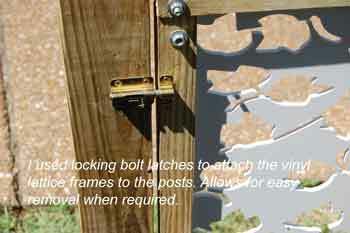 Attach the frame to the lattice with 1/4 exterior bolts as shown. 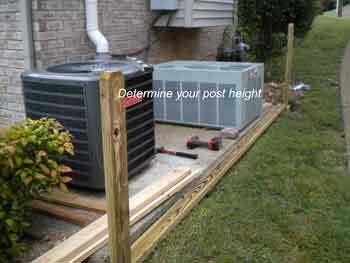 Determine your post height. 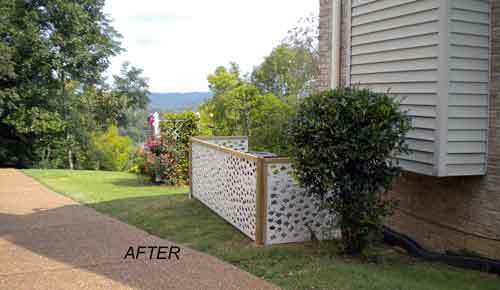 Our lattice is 34 inches high and we want it to be one inch below the top of the post. We want the post to extend above the tallest air conditioner unit. An easy way to determine the height is to run a line level across the tallest unit to the post. Measure from the top of the post holder to the line and make a mark. Then measure from that line to the top of the post. Subtract 1 inch from that measurement and cut the bottom of the post that number. Now run a line level from the post you just cut to the other post. Mark it. Measure from that line to top and repeat the instructions above. Remember to cut from the bottom. 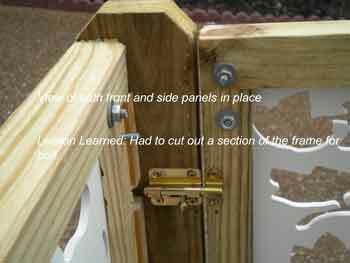 I wanted to install and remove the frames easily so I used bolt latch sets (two on each side)on the front lattice panel as shown below. 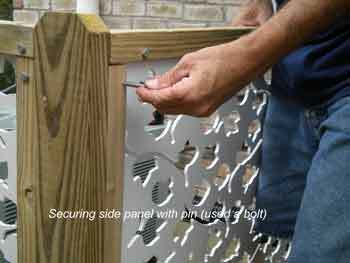 Position the lattice panel between the posts, align the latch bolt sets, and install with screws provided. 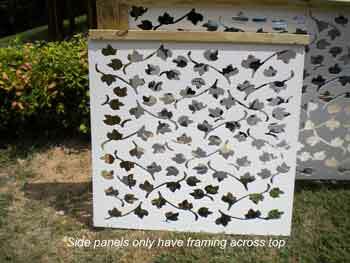 In order to install these, I made my own channel pieces to receive the side lattice panels. I then attached them to the posts as shown below. 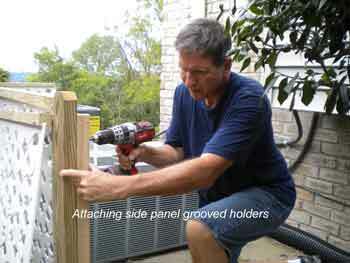 To attach the panel, simply slide it into the channel and drill a hole through the panel frame and the channel. Insert a pin (I used a bolt) through the hole to hold the panel in place. This is what an assembled corner looks like from the inside. 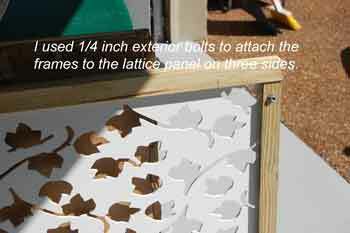 Here's our lattice vinyl project - watch our video of how easy it is to assemble!